"A basic barbecued potato dish takes on a delicious twist thanks to garlic scapes, the flower stalks of the garlic plant. My family absolutely flipped over these potatoes so I take advantage whenever scapes are available. The garlic scapes add a wonderful garlic flavor to the potatoes without being overpowering and they almost have the consistency of young asparagus stalks. 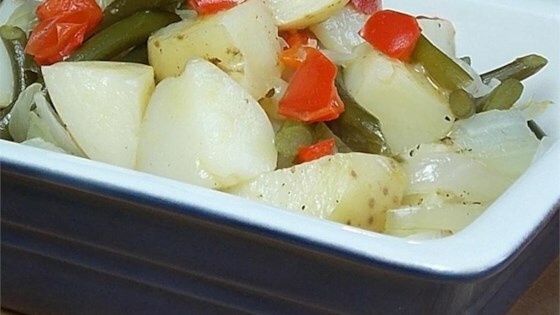 The texture of the potatoes and the scapes is interesting and makes a satisfying side dish to any early summer barbecue." Preheat an outdoor grill for medium-high heat and lightly oil the grate. Cut 6 18-inch pieces of aluminum foil and set aside. Combine the potatoes and scapes in a mixing bowl. Drizzle with olive oil; season to taste with salt and pepper. Divide the mixture among the pieces of aluminum foil and fold the edges of the foil over the potato mixture to seal the packets. Place the packets onto the preheated grill and close the lid. Cook until the potatoes are tender and easily pierced with a fork, 20 to 25 minutes. Rotate the packets halfway through cooking. this is great we used this recipe at camp!!! I used fingerling potatoes and did not chop them. Wonderful! Easy! Will repeat.